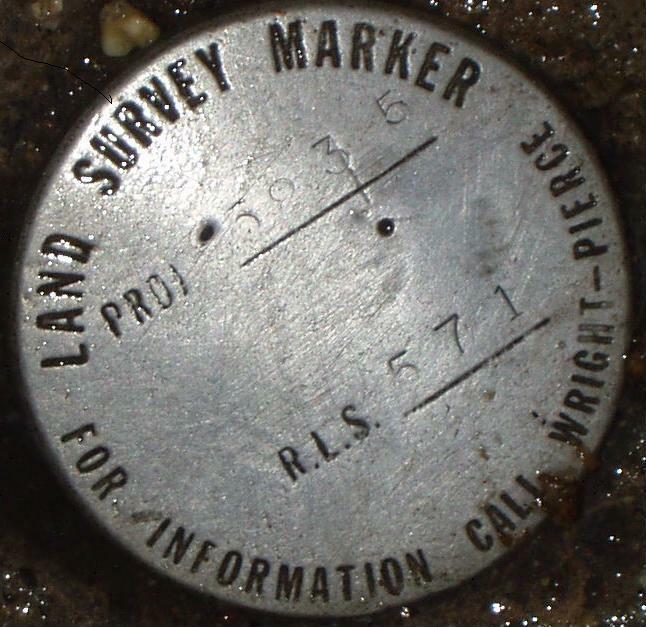 With the generous contributions of photographs and explanations from all you geocachers, we have put together a nice web page showing what survey markers and witness posts look like. ...If life was fair, a banana split would cure cancer. Just added a chiseled cross (pretty dark photo) and a PK nail. Thanks for adding to our knowledge, Tom. For the historically inclined, their is an interesting story about the recent recovery and preservation of one of those original pre-1900 baselines, mentioned in the text on Dusty's page, this one being from 1848. Go to the POB magazine website, click on archives, type in "bodie island" in the search box, and the story will come up. I just posted a witness post for AE8944, (have yet to find the marker itself though, will have to wait for some snow melt) I have also posted a couple of witness posts for ON0783. None of those are ledgible in the pictures though. At the same time they can give a sense of what to look for in the ditches and along the highways. Thanks for the information! This will be very helpful. It marks the Jefferson County Sewer here in Birmingham, AL. Someone here expalined that it was an offset marker. Cheers! Just added some more to the page. Check out the one from the 19th century on the Eads bridge. I would appreciate any suggestions on how to re-organize it. Perhaps into multiple pages. Then again, if we have pretty much reached the end of the major varieties, maybe we are done. Dusty - I'm new to this, found my first NGS marker today in fact, but your site is excellent. I have bookmarked it for future reference. Thanks! Thanks to those who've E-mailed photos in the last we or so. I hope to get some time to add a few to the photo page, but right now it is a little busy. I added british Marker and the currently popular orange Carsonite Witness Post. Thanks for everyone sending the photos of more local governments' markers. Unfortunately, I've made the decision not to post each and every states' marker type (and cities' as well) unless it is unusual. Otherwise the page would get huge. Maybe if I break my leg caching or benchmarking this summer, I'd have the time to redo the page, and move all local markers to a new page. I'll save those photos until I do that. We happened across http://www.bantha.org/~padme/pics/Geocaching-2003-04-06-012.jpg in Portsmouth, NH today (well, yesterday) between some genuine benchmarks. Anyone know more about it? I suppose it was placed by the folks at http://www.wright-pierce.com/ -- so I guess it's one of many varieties of private marker? Team 360 - I used it on the page. Keep building that page. It is a great reference. She said, "Give up caching, or don't come home." Dang I am gonna miss her! Nice job Dusty, I bookmarked it, once it drys out and warms up (drys up, warms out?) here I'm going to check out a 'tidal' benchmark, curious to see if it's a different physical marker or just designation. Maybe I'll actually finish a roll of film doing it and scan them too. Here's one I came acrossed in the Arizona desert last weekend. I tried looking it up on the benchmarking site but there is no zip code for the area and the coordinate search doesn't seem to be working. This is almost certainly a cadstral marker, not a geodetic marker. Its very typical of those in Arizona. Remember, geodetic markers are nearly always set with a view toward extreme permanence and solidity, which would not be the case here, with this one sticking up so precariously. I've seen a few like this in Arizona that were marked as traverse points. Each was marked that it was with the Township and Range it was in and one of a series of similar marks - i.e. 4 of 12. Each one was set in a similar fashion to the one you found, up about 12 inches and in a pile of rocks. The marks I found were in the Virgin River Gorge between Mesquite Nevada and St. George Utah near some caches. Thanx for making this page available! A second type of pipe cap marker is coming, probablye LATE tonight - it is really neat. This one has troubled me some because it looks to me more like a sewer or maintenence access pipe with no real NGS markings on it, but based on the description and the fluerescent orange paint on it, I take it to be the marker in the description. Am I just embarrassing myself here? Team Kender - "The Sun is coming up!" "No, the horizon is going down." Time to bump this one up again. I recently found a couple of River Survey Pipe Caps: PID JD2637 & PID JC0574. Just sent you a couple pics of some Bearing Tree signs. Found them this evening near a benchmark. I cannot find the BM in the database though, so I cannot log it. I have never been lost. Been awful confused for a few days, but never lost! You do not have a Bench Mark, you have a section corner. A section corner defines land. Bearing trees are legal references to the section corner. Thanks for the clarification Elcamino. That would explain why it is not in the database. There are some nice diagrams of different types of disks (reference, azimuth, magnetic, etc.) in an NGS technical report on Horizongal Control that you can look at in Adobe by clicking here. Go about 1/3 of the way down to see Figure 3a (12 USCGS types) and Figure 3b (8 NGS types and 1 NOS type). That's a cool link Black Dog... thanks for posting it! The old paper mentions that witness posts/signs are available to anyone that is willing to place them. I wonder if that is still the case. I would gladly place them near marks that don't have them. DaveD, are these still available to those of us that are willing to install them? I am curious to see DaveD's answer to your question about setting witness posts. One time I asked Deb Brown at NGS via e-mail if I could get some posts to set by control points I find. She replied that they do not do that because of the liability of having non-NGS personnel pounding posts into the ground and possibly damaging underground utilities. Dusty I sent you a photo of QZ0572,,a different type of benchmark> I dont see it with your others, aren't you interested in this one? If you did not recieve it let me know I will resend it,,I think it is a nice one,,a benchmark that one can go and camp in. What could be better, benchmark hunting and camping out, in the benchmark! Montana - I have been busy, so it has taken me this long to get several "donations" added to this we page, but I am done, now. Many folks don't add their GeoCaching.com ID to the message, so I don't know which photo(s) or text are yours. If anyone sees that I need to change a name to a user ID, just let me know. I added a canal mark, a third type og pipe cap, a bearing tree, and mark "building" and more. Some of the new pictures are HUGE when you click on the thumbnails, like the cloth mark/signal. If people have problems loading them, please let me know and I'll shrink them down. And thanks to all of you that have donated pictures and explanations. this started out as a small page to show folks what a witness post looked like, and has really grown. I just added a brass plug, a Disney marker, a screw, and several misc markers to the end of the page. I just added a really NEAT iron obilisk at the US-Canada border. Funny, this web page started when I saw my first witness post, and realized that many of us had never seen them and were confused by all the references to them. I think I may need to reorganize it as now the page is getting very long. Keep those photos and text coming, please. If they are something new, I;ll add them when I can. Alo, some of the photos are unclear or drk. If you get a better photo of the same type of marker, I'd be happy to add that as well. If I understand correctly what you're doing, I may have one to add. On a recent trip to the Smoky Mountains, I inadvertantly discovered a North Carolina Geodetic Survey marker, at Newfound Gap. Would you like me to send it? About time for a BUMP! I was talking with a fellow cacher last Saturday and he told me of finding a sign for a witness tree. I specifically asked him about the wording and he said it actually said "witness tree" and was attached to a tree. I've never seen any mention of anything like that here so I thought I'd mention it. I asked for pictures but he didn't take any. It was down in Arkansas somewhere. Hey DustyJacket, I hope someday you get a chance to log this TB or this one. I'm hoping they make it the States so lots of Benchmarkers will get a chance to see them! There used to help relocate the item. Usually ther are 3 or 4 to a benchmark or section etc. Not really used much anymore either. Most counties or other govt. entity will set other survey markers for "witness trees"